James John Corbett (September 1, 1866 – February 18, 1933) was a heavyweight boxing champion. He was best known as "Gentleman Jim," the man who defeated the great John L. Sullivan. A new breed of boxer was born when Corbett won the heavyweight title from Sullivan, the last of the bare-knuckle fighters, in 1892. Corbett was an educated man who practiced the science of boxing. He broke the mold of the stereotypical brawling prizefighter. He was college educated and in addition to boxing, pursued a career in acting, performing at a variety of theaters. His fight with Peter Courtney on September 7, 1894, by means of a Kinetograph, was only the second boxing match to be recorded. In addition to his officially sanctioned professional bouts, he fought over 150 exhibition matches, many against well known opponents. In his title defense in 1894, Corbett knocked out Charley Mitchell in three rounds, but lost the heavyweight crown in 1897 to Bob Fitzsimmons in 14. After retiring, he returned to his acting career and wrote a successful autobiography that was later made into a movie starring Errol Flynn. Corbett represented the new age of boxing, fighting all of his matches wearing gloves and under the Marquis of Queensberry rules. He has been called the "Father of Modern Boxing" because of his scientific approach and innovations in technique. Corbett was born on September 1, 1866, in San Francisco. He was raised in a middle-class home, attended college, and worked as a bank clerk. He learned his boxing not on the streets, but in sparring clubs. He studied boxing under the guidance of Walter Watson at San Francisco's Olympic Club. Corbett wore his hair in a full-grown pompadour, dressed smartly, and used excellent grammar when he spoke. He stood at six-foot, one inch with a reach of 73 inches. Because of his handsome appearance and classy ring style, he earned such nicknames as Handsome Jim, Pompadour Jim, and finally, Gentleman Jim. Corbett was married to Olive Lake Morris from 1886 to 1895. Corbett's first pro fight came when he was 18 and he knocked out Frank Smith. His career took off, however, with a series of bouts against fellow hall-of-famer Joe Choynski. They met three times in a three-month span in 1889. The first bout was a "no contest" after four rounds. Corbett won the second with a 27th-round knockout and the third with a four-round decision. The first fight was interrupted by police, but the middle bout, contested six days later, was an epic contest fought on a barge in San Francisco Bay. The seams from Choynski's gloves cut Corbett in round three. And later in the fight Corbett broke his left hand. Yet, he managed to summon enough power to knock out Choynski later with a left hook. On May 21, 1891, Corbett fought respected heavyweight Peter "Black Prince" Jackson, after the reigning champion, John L. Sullivan, refused to fight Jackson because he was black. Corbett and Jackson, a fellow hall-of-famer, fought to a draw after 61 rounds. A month after that bout, Corbett boxed a four-round exhibition with Sullivan, giving him a preview of things to come. The much-anticipated Sullivan-Corbett fight took place before 10,000 people on September 7, 1892, in New Orleans. This was the first heavyweight championship bout in which the participants wore gloves, marking the end of an era in which John L. Sullivan became a legend in his own time. He had won the Heavyweight Championship title in 1882 and had successfully defended it for ten years. Sullivan rose to the pinnacle of his profession at a time when many states and local jurisdictions outlawed boxing matches, giving the sport a status that lay somewhere between marginal respectability and outright criminal behavior. Nonetheless, Sullivan's championship matches attracted thousands. In the championship bout, Corbett, with Prof. Mike Donovan in his corner, boxed brilliantly. He countered sharply and managed to sidestep Sullivan's bullish charges. In the twenty-first round, Sullivan was exhausted and Corbett pounded the champion into submission, knocking him out with a right hand. In his only title defense, on January 25, 1894, Corbett knocked out Charley Mitchell of Great Britain in three rounds. On September 7, 1894, he took part in the production of one of the first recorded boxing events, a fight with Peter Courtney. This was filmed at the Black Maria studio at West Orange, New Jersey, and was produced by William K.L. Dickson. It was only the second boxing match to be recorded. 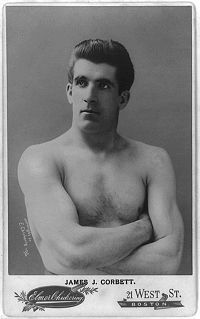 Corbett lost his championship to the Cornish boxer Bob Fitzsimmons, who knocked him out in the fourteenth round on March 17, 1897, in Carson City, Nevada. In 1900, Corbett challenged heavyweight champion James J. Jeffries—who was his former sparring partner—and was knocked out in the twenty-third round. They fought a rematch in 1903, and this time Jeffries scored a tenth-round knockout. In between the two Jeffries fights, Corbett knocked out middleweight champion Charles "Kid" McCoy in the fifth round. Following his retirement from boxing, Corbett returned to acting, appearing on stage and in film. He also coached boxing at the Olympic Club in San Francisco. Corbett authored his autobiography under the title The Roar of the Crowd. It was serialized by The Saturday Evening Post in six weekly installments during October and November of 1924. The following year, G.P. Putnam's Sons published it in book form, marketing it as the True Tale of the Rise and Fall of a Champion. In 1942, the story was made into a Hollywood motion picture titled, Gentleman Jim, starring Errol Flynn as Corbett. On his passing in 1933, in Bayside, New York, Corbett was interred in the Cypress Hills Cemetery in Brooklyn, New York. Corbett's introduction of the Marquis of Queensberry rules improved the status of professional boxing by regulating the participants' behavior and dampening the potential barbarism of the ring. At the same time, the boxing clubs that formed the foundation of the sport standardized the various weight classes. Boxing was making a transition to a legitimate, money-making form of sport. Jim Corbett represented the new age of boxing. From the time his career began in 1886, he fought all of his matches wearing gloves and under Queensberry rules. Corbett has been called the "Father of Modern Boxing" because of his scientific approach and innovations in technique. The Sullivan-Corbett fight of 1892 marked a watershed for professional boxing as the sport moved out of the shadows of criminality into the realm of acceptable public entertainment. Record: Won-12 (KO 5); Lost-4 (KO 3), Draw-4 (28 bouts). On its creation, he was elected posthumously to the International Boxing Hall of Fame. Corbett's fight with Peter Courtney (September 7, 1894) was only the second boxing match in history to be recorded. ↑ Since records were not officially kept, Corbett's record is variously estimated. He also fought more than 150 exhibition bouts, many against top opponents. History of "James J. Corbett"
This page was last modified on 16 March 2018, at 15:59.